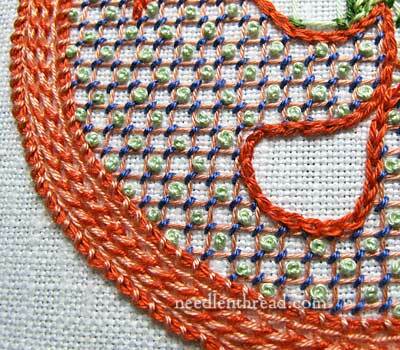 Stitch Fun: Lattice Sampler – ‘Tis Finished, but There’s More! 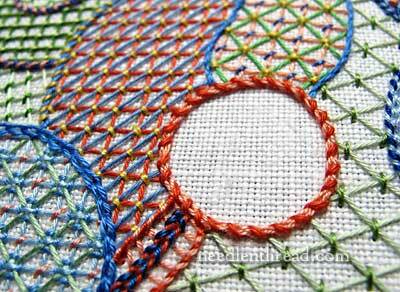 Remember the Lattice Jumble Sampler that somehow morphed out of the Stitch Fun series? It’s been a little while since we visited it, but I thought I should let you know that it’s finished. Lattice Sampler Layout Guide – It’s a-Comin’! Several stitchers have requested a “layout guide” for the sampler, so I’ve worked up something that includes close-ups, diagrams, the layout of the sampler in sections, and even some stitching tips. The Lattice Jumble Sampler Guide is now available here! Do look for it! 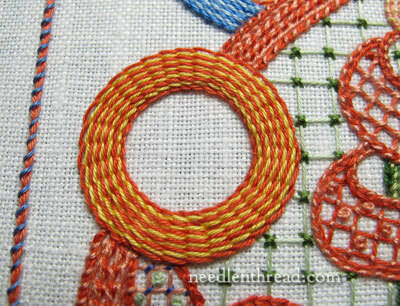 If you’re stitching the Jumble with a group or individually, or stitching your own version of the Jumble, you’ll find it mighty handy to have a printable layout with tips, close-ups, and explanations of stitches and combinations of stitches. The pattern for the sampler was titled Jacobean Jumble, so I call it lots of things – Jumble, Lattice Jumble, Lattice Sampler, Jumble Sampler. One thing I don’t call it is “Jacobean,” because, aside from a few elements twisted into the design, I’d be hard-pressed to make a case that the thing smacks of anything remotely Jacobean. The last major part to finish on the sampler since the last time we visited it was this wide path running along the lower left side of the design. The path breaks at this circle, and then continues up into the middle of the design. The voided area in the middle of the circle above stands out in pretty high contrast on the sampler, because there aren’t many empty spots within the embroidered area. This is another voided circle, and below it, just to the lower left (at about 7:00 o’clock, if you think of the circle as a clock face) was the other little bit that had to be finished. It’s an extension of the stem that passes up around the spiral on the top right side of the design. I had a moment’s hesitation about these three elements. I almost took them out! But then I remembered that this was just a Stitch Fun Sampler – it was supposed to develop randomly. And these were part of its random development. So I left them, after all. If you’d like to work this sampler on your own using the convenient layout guide, you’ll find the Lattice Jumble Sampler Layout Guide available right here. It’s an e-book, so you can get it today, and start creating your own unique lattice jumble sampler. 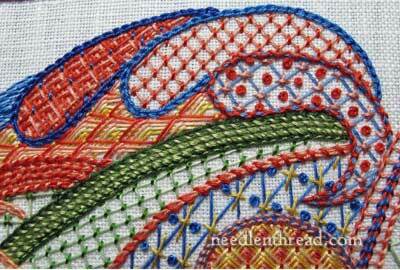 May 8, 2013 Lattice Sampler – Almost Finished! It’s a lovely jumble. The detail pictures makes me think of a map of with roads, rivers and reservoirs and railways, with all the fields coloured with different patterns according to who owns them or the underlying geology or something. This is awesome, Mary! I’m looking forward to the guide. As always you’re a phenomenal teacher. Thank you so very much. Have a great day! Thanks for the Lattice stitch fun samplar I think Lattice stitch is lovely and through this samplar you have shown us so many different Lattice stitch techniques, I can’t wait to try them. Next time I use Lattice stitch I will certainly refer to the samplar for ideas, thanks for all your efforts in producing such a lovely fun design. These snapshots are lovely. I like your youthful color scheme, it reminds me of a child’s daydream, the mind-product of a day spent in a fairytale. I only wish we could see the whole masterpiece! I feel as if I’m being spoon fed red velvet cake when all I want to do is fall in face first. I appreciate your post nonetheless. Thank you, thank you, thank you, for granting my wish!!! I absolutely love this jumble!! This looks like a marvelous project! Since it IS a sampler, and samplers are traditionaly signed and dated, and often times have a saying or dedication, you could use the currently unstitched areas for that. So happy you are making a Layout Guide available. 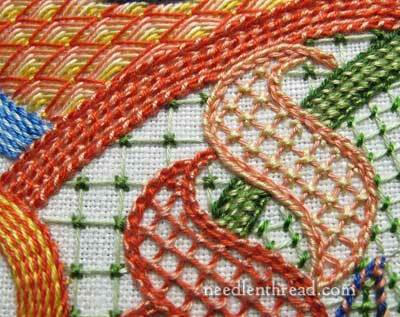 I’m wasting a lot of stitching time looking for the various pieces. Thank you! You are so kind and generous with your time to go back through your project and make a guide for all of us in your needlework audience. Thank you. Thanks so much for sharing this. I’m so excited to be able to learn all these new techniques. I’m amazed how some relatively simple stitches can produce complicated effects. You are such a great teacher! Maybe call it a crazy quilt sampler?? Somewhere in the first third of this Stitch Fun series, I decide I’d like to work through it as a sort of teaching project for myself..to learn the stitches and work through the whole thing, just as you did, Mary. Having a guide is really going to be helpful. Thank you! I have begun the sampler. Is the new version of the guide different from the first version ?